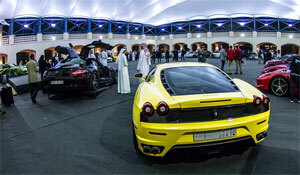 By the end of 2013, Saudi Arabia had imported 777,000 cars, making it the largest importer of automobiles in the region. There’s talk, however, that the state could be producing its own automobiles by the year 2017, which will create plenty of jobs. Furthermore, Saudi Arabia has been investing in technician training, so the bright future for the nation’s automotive industry has already begun. Luxury automobiles like Cadillacs and Lincoln Continentals do quite well in a region where gas is often cheaper than water, but smaller cars fare just as well. In fact, as much as 70% of the vehicle imports in Saudi Arabia were imported from Japan. These imports include Mazda, Toyota, and Datsun-Nissan. The Corolla ranks consistently high among Saudi drivers, but one-ton pickup trucks aren’t unheard of either. Also playing host to strong sales in the region are the Nissan dealerships, sales which are expected to continue on the up in 2014. Other popular models in Saudi Arabia include the Hyundai Elantra, Chevrolet Impala, and GMC Yukon. It may be no surprise that one of the world’s leaders in oil and gas production will soon take part in automotive production as well. With demand increasing in West Asia, luxury car maker Jaguar Land Rover Automotive is looking into investment in a new Saudi facility that plans to produce 100,000 vehicles annually once the factory is up and running. The deal would employ approximately 5,000 people and see Land Rovers produced in the Arab state. The proposed plant would be located in the kingdom’s eastern province. Saudi Arabia has expanded shipping ports, added rail lines, invested in workforce education, and is now attracting automotive makers and suppliers. It’s becoming a major hub in the region, with ambitious plans for Saudi-made vehicles to total 400,000-plus each year over the next decade. With the kingdom state already enjoying momentum from previous expansions, these plans will no doubt come to fruition by the year 2030. Saudi Arabia is currently focused on expanding education due to its young population (two-thirds of Saudi Arabia’s citizens are under the age of 30), and adding automotive production and investing in infrastructure will create a bright, secure future for the up-and-coming generation. Sources within the industry believe that this is the next logical step. Saudi Arabia is still the largest importer of vehicles in the Middle East, but it’s on its way to becoming a force in automotive production. Europe, the US, and Asia may all have to watch out as the nation’s automotive industry roars up behind them.